Premium members click here to view this article in the ad-free members area. Not a member yet? Sign up now! Though it's waged a bloody war against the Nigerian government for many years, rebel group Boko Haram rarely could claim significant territorial control until recently. Though they did take over a number of remote areas in spring of last year (see our 2013 Boko Haram control map), the militants were soon driven back into hiding by the Nigerian military. The insurgency never went away, with Boko Haram's bombings and other attacks, often on schools and other public places, increasing in number and lethality from 2013 into early 2014. (Also see our 2013 report for more background on Boko Haram). However, this summer saw a striking change in the trajectory of Boko Haram's rebellion. Likely inspired by the Islamic State organization in Iraq and Syria, Boko Haram initiated a new strategy of capturing and holding towns and villages. The campaign began in late July, and has gone much farther than last year's seizure of several small towns. By early September there was talk of an imminent invasion of Maiduguri, the capital of Nigeria's far northeastern Borno State. That hasn't happened yet, but neither does Boko Haram seem to be abandoning its newly won territory anytime soon. *There are hundreds of local languages in Nigeria, but only English is official. The following is a timeline of major events and changes to territorial control since Boko Haram began seizing towns in northeastern Nigeria this summer. 2014.04.15 Boko Haram kidnaps hundreds of schoolgirls in Chibok, Borno State, gaining attention from around the world. At this time, Boko Haram is not yet known to hold any clearly-defined territory. As of September 2014, the Chibok girls are apparently still missing, and the town is said to be abandoned. 2014.07 Boko Haram erects tollgates on major routes in northern and central Borno State, where it holds rural influence. 2014.07.21 Boko Haram reportedly captures Damboa, raising its flag over the major Borno town. 2014.07.23 Boko Haram destroys a bridge between Maiduguri and Ngala, Borno State. Current control of Damboa is unclear, but there is no government presence. 2014.08.03 Around this time, Boko Haram takes over Gujba, its first town captured in Yobe State. 2014.08.06 Boko Haram seizes the key town of Gwoza in Borno. 2014.09.10 Around this time, Boko Haram occupies the town of Ashigashia just outside Nigeria's borders, in neighboring Cameroon. 2014.08.11 Nigerian government claims to have recaptured Damboa. A month later, the town is reportedly still deserted. 2014.08.17 Over the weekend, Boko Haram reportedly takes control of Michika in Adamawa State, but the town will be more widely reported as captured three weeks later. 2014.08.21 Boko Haram takes Buni Yadi in Yobe State. 2014.08.21 Boko Haram captures Madagali, Adawama State. 2014.08.23 Boko Haram takes over Pulka, Borno State. 2014.08.24 Media report that Boko Haram leader Abubakar Shekau has declared a "caliphate" (Islamic empire) in Gwoza, but he may only have meant that it was now ruled according to Islamic law. 2014.08.25 Boko Haram captures Ngala and Gambaru, Borno State. 2014.08.28 Boko Haram captures Dikwa and Marte, Borno State. 2014.08.29 Cameroon's military retakes Ashigashia town from Boko Haram. 2014.09.01 Boko Haram attacks Bama, Borno State. 2014.09.02 Bara in Yobe State captured by Boko Haram. 2014.09.02 Boko Haram allegedly captures Bama, a major town in Borno, but the situation remains unclear. 2014.09.03 Boko Haram seizes Banki in Borno State and Gulani in Yobe State. 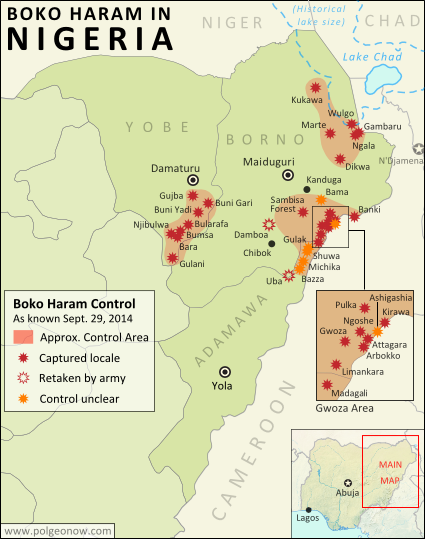 Boko Haram control in Nigeria, 2013 (click for free map and report). 2014.09.07 Boko Haram captures town of Gulak, Adamawa State. 2014.09.08 Boko Haram captures Michika, Adamawa State. Government claims to recapture Bama. 2014.09.10 Nigerian military claims to recapture Michika, Uba, and Gulak. 2014.09.11 Bama residents say Boko Haram controls the town, despite continued government insistence to the contrary. 2014.09.13 Unidentified Boko Haram commander reportedly captured during attempt to occupy Konduga. 2014.09.18 Catholic Church source says Boko Haram now controls 25 towns. In addition to locations already mentioned, the list includes Shuwa, Kukawa, Bularafa, Bazza, Buni Gari, Bumsa, Taltaba*, Limankara, and Njibulwa. Michika, Gulak, and Ashigashia are also still listed despite earlier claims they were retaken by government forces. A longer accounting of "31 towns and villages" adds Wulgo, Ngoshe, Attagara, Barawa*, Arbokko, Kirawa. 2014.09.19 Nigerian government begins investigating the possible death of Boko Haram leader Abubakar Shekau. The army of Cameroon also took credit for Shekau's death, but some believe he was actually killed over a year ago, and that the recent death was of an imposter. 2014.09.26 Boko Haram again tries to capture Konduga, on the way into Borno State capital Maiduguri, but is stopped by government forces. *PolGeoNow was unable to determine the precise geographical locations of Taltaba and Barawa. For this reason, they do not appear on the above map. 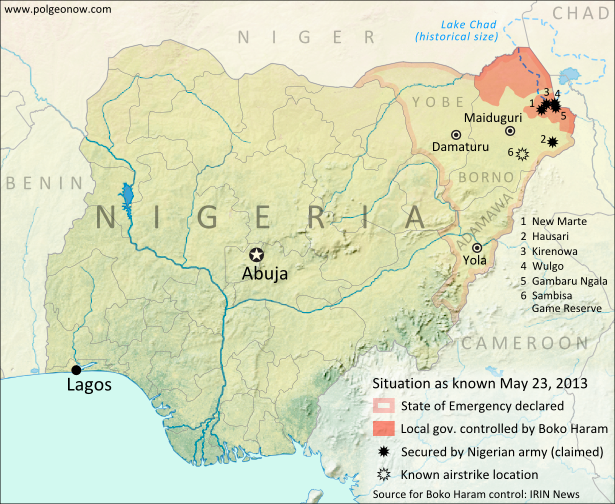 Don't miss future updates to the map of Boko Haram control in Nigeria! Become a member now!